« American Brands are Not Good Enough for High Rollers? 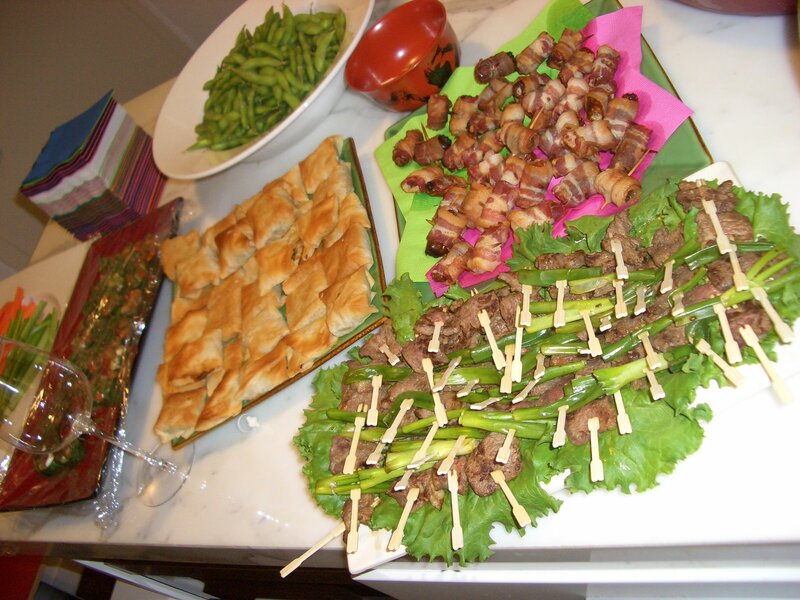 Aside from all the complicated dishes, I make a lot of party food since I love hosting parties. People, please don’t start with “how come I never get invited? !” I was the one who invited all of you in the past when I lived in NJ, and no one even bothered to show up! Anyhow, the next evening after I made Peking duck, (main course of that evening was hand rolled sushi. I had bunch of fish leftovers as well) I hosted a Pride weekend party for my bf’s friends. 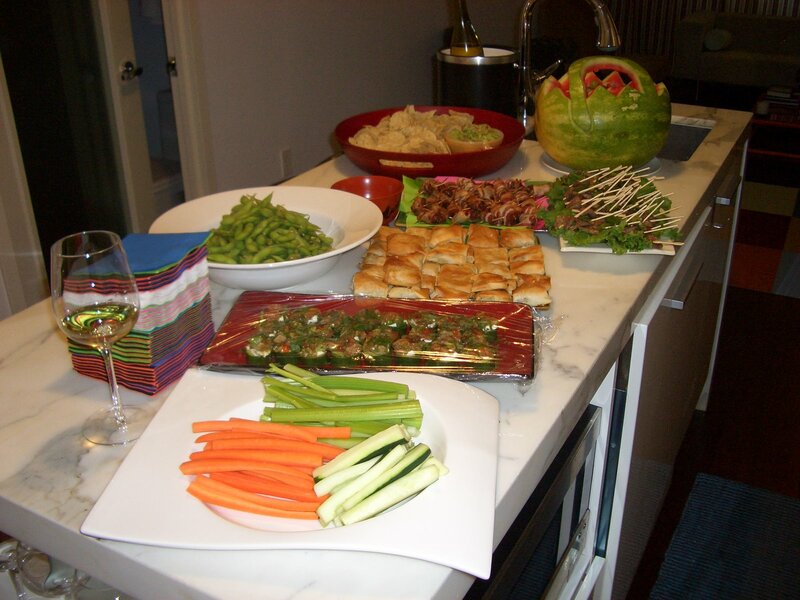 Since it’s a party, you don’t want to make things that require cutting or plating. Also this helps the cleanup since you don’t have to wash too many small plates. By the way, I am dead against using plastic plates. No, I am not an environmentalist, I just think it’s very trashy to use plastic. I just buy bunch of little cocktail napkins, and people can rest their food on them. How cute, right? boil the things, put in a TON of kosher salt, and you are good to go. Marinate cut up beef (use fattier part so that it doesn’t dry up after cooling off) in soy sauce, sesame, ginger, sugar and garlic overnight. Sauté them in hot pan, get a nice color. Once they are cool enough, skewer them. cut bacon into 3, then wrap pitted dates with it, put tooth pick to hold it. Put them on top of rack so that grease will render, bake them on 400 oven for about 20 minutes, or how you like your bacon to be. Salty and sweetness, the best combo! cut English cucumber into about half inch thick, and with a small spoon, make a small hole, set aside. Mix cream cheese, sour cream, chives, mayo (of course, you gotta use the Japanese one), salt and pepper together. pipe it onto the hole you made on cucumber, top it with a small chunk of salmon. You can use smoked salmon as well, but since I had salmon sashimi leftovers, I just used them. mix avocado, lime juice, garlic, tomato, minced parsley (I don’t like cilantro), and salt together. mix ground pork, nira (they call it chives, but it has a lot more garlic flavor than chives, you can buy them at Japanese grocery stores), ginger, soy sauce, salt, pepper, an egg together, put small amount in gyoza skin and make into a gyoza shape. 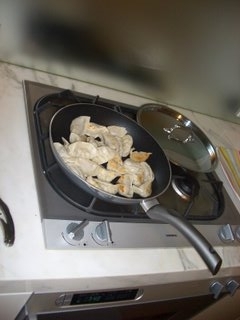 I will probably blog about specifics of gyoza making after I have better pictures of the process in the future. cut up left over duck, and sauté them with chopped onion, scallions, and vermicelli noodles, and hoison sauce. Let it cool. Take philo dough gently, and stack 5 of them (of course you paint butter in each layers to get crispy and flaky), cut them and put small amount of duck mixture, and wrap it however shape you like it. Bake them till golden brown. cut watermelon into small squares, and put small amount of goat cheese shaped into a ball, stick a tooth pick, and that’s it. I hate goat cheese, so I don’t eat it, but people seem to love it. I had goat cheese leftover, and had some figs, so basically created the same thing as above. cut sashimi into small chunks, pour soy sauce and wasabi, marinate it, and put them on top of a cracker. I had a frozen eel, left over baguette as well as Brie cheese, so cut them up, put eel on top of baguette, topped with cheese, baked them. This sounds odd, but good stuff. Below is the spread of the evenings food items (some were on different tables since no pics). We had about 15 guests, all the food eaten, about 20 bottles of wine drank, a couple of hook-ups, everyone went home drunk, happy, and full. What a great success! This entry was posted on July 10, 2007 at 4:55 pm and is filed under *Yamahomo, recipe. You can follow any responses to this entry through the RSS 2.0 feed. You can leave a response, or trackback from your own site.